“The infinite tango takes me towards everything,” writes Jorge Luis Borges (1899-1986) in his poem “The Tango”. It is one of many depictions of tangos and milonga in his work. Tango is a dance of the street, introduced to Latin America by African slaves dancing to the beat of a music known as Candombe. Condombe couples kept a physical distance between one another as they danced, however. When their dance branched out into milonga and tango, the proximity between the two bodies became an essential aspect of the process. Never mind that the Pope died in the same year, his desperate calls could not stop the catapulting popularity of this brand of indecency. Half a century later tango took Europe by storm; France introduced the sinful dance to the old world and in the 1920s Britain codified it to be taught in dance schools. A dance full of passion and fire, ardent and romantic by turns, its heart still belongs to Argentina. Tango is a visually attractive dance; it impresses with its hints of eroticism. When Argentines perform it, its many faces are revealed: the joy and the sadness, the melancholy and the zeal. They reveal a tradition deeply rooted their souls and honed by the technical mastery. 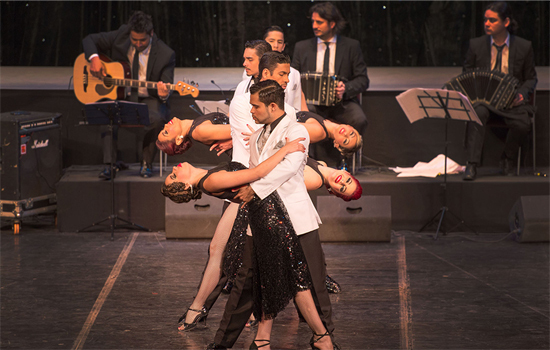 Between 12 and 15 January, 20 artists took the stage of the Cairo Opera House, inviting the audience on a journey through tango. A Puro Tango Company presented “Life and Feelings”, a series of dance numbers intercalated with songs by David Gutierrez Ramirez. Established in 2002, the troupe consists of professional dancers with Argentine and Colombian backgrounds, most of them champions of the tango competitions held in Argentina and Colombia. With Sebastian Avendano as general director, the company has travelled across the Latin America and the United States, paying a few visits to Europe. This was their first appearance in the Middle East and Africa. The Egyptian audience are keen to attend tango and dance performances in general, so no wonder the hall was almost full and the enthusiastic spectators rewarded the dancers and the singer with generous applause. This is not the first time that the social dance makes its way into the main hall of the Cairo Opera. Over the past years, the Inaki Urlezaga Ballet Concierto troupe has been among the Opera’s returning guests. It’s a company that adds ballet steps to tango and other social – and ballroom – dances, reflecting its members’ classical background. With headquarters based in Medellin, Colombia, A Puro Tango carry the word “puro” or ”pure” in their name, and their intention is to bring to their audience the essence of tango: traditional, nuevo and milonguero with a nuevo twist. Many were the moments when it almost felt as though we were on the outskirts of Buenos Aires, where spontaneous passion carried street performers through narrow lanes. Two bandoneonists (Pablo Jaurena and Marco Blandon) and a violinist (Andrij Kushnir) seated among other musicians at the stage complemented the image. The numbers performed incorporated one or several pairs, from duets to quintets on stage, as the troupe performed tangos, milongas and tango vals (waltzes), to music that ranged from traditional tunes arranged by Jaurena to compositions by Astor Piazzolla, the iconic Argentinean composer who revolutionised tango music. Allowing the dancers to change and prepare for the dance, the distinctive baritone of David Guttierez Ramirez was appealing and evocative. A Puro Tango Company manage to communicate an artistic, highly aesthetic image, always keeping the right balance of emotional spontaneity and technical rigour. Even though the technique of the dance evolved in order to generate a practical approach to the types of movement, the power of tango depends on the general form, the right mood and the instantly liberated emotion reaching the passersby or in this case the audience. In a sense placing tango in a concert hall is a betrayal of the core sensitivity of the dance, which like an innocent child growing up is suddenly required to adapt to surroundings and abide by rules. But it is this that defines the technique, allowing dancers to implement a system of directives that give tango a base, and aid the dancer in performing step, figure or movement in an accurate and effective manner. 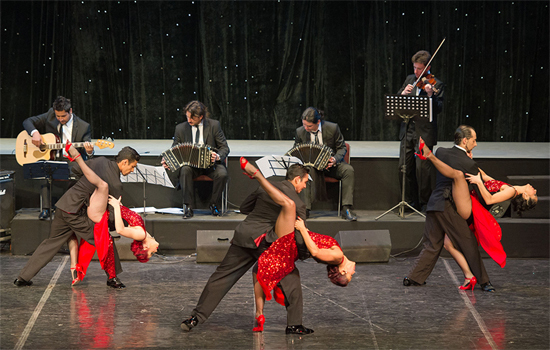 At the same time tango evolves, its techniques are constantly being improved and its language increasingly transcending geographical and cultural barriers. In their show, A Puro Tango Company melded technical perfection with the natural spontaneity of the dance. The performance was visually captivating and one enjoyed following the steps and artistic combinations, but there were moments when the setting felt wrong. One would close one’s eyes and transport oneself to a cobbled street where stylised fileteados (stylised, decorative drawings, often incorporating plants) adorn the vehicles and where men stop for a chat at the doorsteps of colonial buildings while the children are running after the ball dreaming of Lionel Messi. And at that moment one realised that it was only in the city’s contradictory nature, beautifully captured by Borges in his first collection of poems, Fervor de Buenos Aires (Passion for Buenos Aires, 1923), that one found the full charm and the many meanings of tango.